The mysteries of the East. Fascinating and mysterious, vast, sweeping and truly, wholly, a world away from the West, combining an ages-old civilisation and cultural mix with the glass and steel of the 21st Century world into which it is rapidly emerging, China is a wonder to behold, and a joy to experience. Flights also available from airports in England – London Heathrow, Manchester & Newcastle – click here for more information on dates & prices. Upon arrival, you’ll meet your guide and transfer by coach to your overnight hotel, before enjoying a guided introduction to this amazing city. The colonial grandeur of the buildings that line the famous Bund hint at past glories despite the towering skyscrapers that surround them, and the rocket-shaped Pearl TV Tower (a visit to which is included in the tour, and from which the views are simply breathtaking) soars above them all from the opposite bank. This morning you’ll tour the bustling bazaars of Shanghai’s historic Old City, at the heart of which is the 16th-century, classical Chinese Yuyuan Garden, with its pools, walkways and bridges. After a fascinating morning, you’ll return to the airport to board the internal flight to Beijing for a three-night stay. Enjoy a fascinating tour of China’s astonishing capital. First stop is massive Tiananmen Square, site of Chairman Mao’s Mausoleum and the Great Hall of the People, and which faces the best-known image of Imperial China, the huge complex of imperial palaces known as the Forbidden City. Inside this immense palace you’ll see the ceremonial spaces, working areas and private quarters once used by it’s privileged occupants before heading to the beautiful Temple of Heaven in Tiantan Park, the great Ming Dynasty shrine that was the heart of ceremonial life for five centuries. Later, celebrate the end of your first day in Beijing with a ‘Peking Duck’ dinner. See for yourself part of what is famously (though not entirely accurately) the only man-made structure visible from space, the Great Wall. 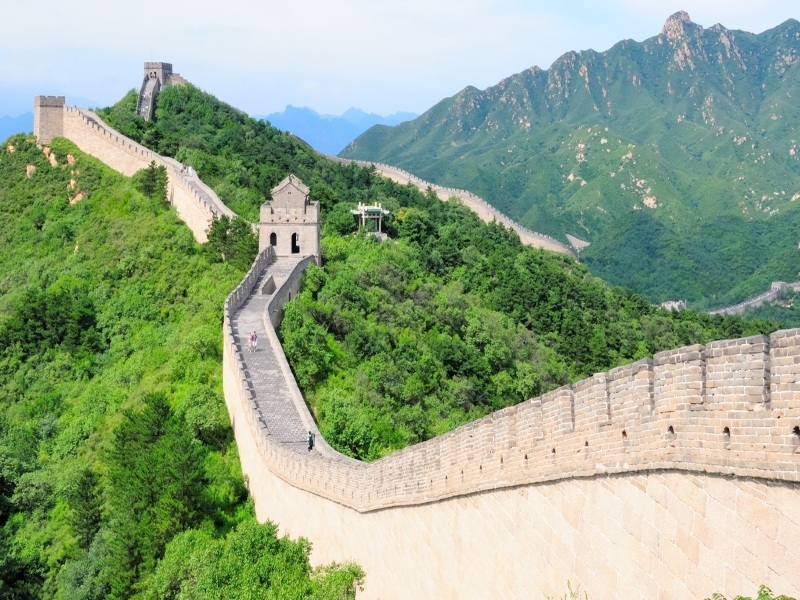 At Badaling, amid steep, forested hills, part of the wall has been lovingly restored, and it’s easy to appreciate the immensity of this marvellous feat of engineering. Your day will also include time to view the famous Olympic stadium and, later, an optional excursion is offered to the world-famous Peking Opera. Take a trip back in time on our optional rickshaw tour of the ancient hutongs, the labyrinth of narrow alleyways and courtyard houses that epitomises ‘Old Peking’, before heading outside the city-centre to discover the tranquil lakeside pavilions of the Summer Palace. In the afternoon we’ll transfer to the airport for our internal flight to Xi’an. Today you’ll visit the now legendary Terracotta Army of the first Chinese Emperor, Qin Shi Huang. An estimated 8,000 lifelike foot-soldiers, horsemen and charioteers were discovered in their vaults in 1974, and now are one of the world’s greatest tourist attractions. Later, head back to the city to spend some time on the fortified city walls of old Xi’an. Returning to Xi’an, you’ll explore the ancient city, centred on its enormous bell-tower, visiting the Muslim Quarter with its Great Mosque, and marvelling at the Tang dynasty monuments. In the afternoon, fly south to Guangxi province and the historic city of Guilin, picturesquely set on the Li River. Take a guided tour of this medieval city, and see the ancient South Gate, the Farmers’ Market and the peak of Fubo Shan, with its caves and carved grottoes. This morning you’ll board a river cruiser for the unforgettable journey through the stunning scenery of peaks, paddy fields and green-tinged waters of the Li. You’ll stay overnight in Yangshuo, a thriving, resort set amid some spectacular scenery. This evening, there’s a stunning, optional Light Show to experience. After breakfast, you’ll transfer to the airport and fly back to Shanghai for the last night of your tour. Once back in the city you’ll have the chance to enjoy an optional night-time cruise on the Huangpu River – a fitting way to end your visit to this great country.